KEYSTONE, SD: The National Park Service announces the official launch of the Mount Rushmore Digital Preservation project. 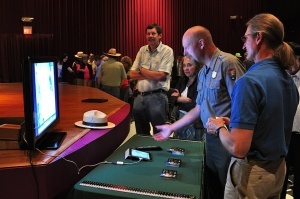 At a press event held this week in Rapid City, the National Park Service and partners Kacyra Family Foundation/ CyArk (CyArk) unveiled the results of a multi-year digital preservation project. The project has created a highly accurate 3D model of the park and sculpture and is also beginning to digitize portions of the museum’s collection in 3D. The project aims to help in the preservation of the monument and increase public access to park resources through virtual access to restricted park areas and artifacts. Project results include a new digital portal, ten teacher-developed K-12 lesson plans, a free mobile app and a new exhibit scheduled to open later this year at the park. Forthcoming results include a 3D virtual museum of normally inaccessible artifacts and a 3D educational game for children. The project began in May 2010 when Mount Rushmore National Memorial and CyArk collaborated with Respec Engineering, Wyss Associates and the Center for Digital Documentation and Visualisation, a partnership between Historic Scotland and the Glasgow School of Art. The Scottish team worked to capture the memorial using laser scanning and photography, making the site the first international project of the Scottish Ten. The Scottish Ten is an ambitious five-year project using cutting edge technology to create exceptionally accurate digital models of Scotland’s five UNESCO designated World Heritage Sites and five international ones in order to better conserve and manage them. 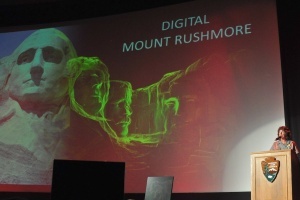 A variety of locations at Mount Rushmore National Memorial were laser scanned and photographed to capture the Memorial and create a highly accurate digital model. Leica-Geosystems provided additional project support by contributing hardware and software to the effort. The resulting information was used in the development of media for physical preservation work, education, and virtual visits. In April 2012, CyArk returned to the park with partner Autodesk, to capture many historic artifacts within the park’s collection. Using high-resolution DSLR cameras the team worked to photograph everything from carver’s hand tools to portions of the sculpted Mount Rushmore surface. Using Autodesk’s reality capture software, the photos were used to create digital 3D models of the artifacts that provide detailed surface and shape information. Physical replicas of the digital models can then be produced by a 3D printer or made virtually available to the public through the web. "New technologies for converting photos into digital 3D models will accelerate the ability to preserve and share the world's historic landmarks with students, researchers and more," said Brian Mathews, Vice President of Reality Capture at Autodesk. "We’re excited to provide technology that will help these organizations scale their mission of preserving our landmarks and connecting these heritage stories with larger Internet audiences." The public will have an opportunity to experience some of these 3D capture technologies first-hand on July 3rd at the CyArk Digital Preservation Station at Mount Rushmore National Memorial. The station will be open throughout the July 3rd celebration at the park and members of the public are encouraged to visit the station throughout the day to gain hands-on experience with 3D capture, digital modeling, and 3D printing. Additional information will be available through the park and CyArk websites.